If you want to indulge yourself in a relaxing bubble massage without spending a fortune, Intex PureSpa portable bubble massage spa set is right for you. This hot tub can calm tired muscles and eliminate your body stress without deflating or damaging your budget. Hot tubs interestingly have become a popular way to relax and let the daily stress melt away along with all those annoying muscle aches and pains. The cost of installing a hot tub at home however has been a major concern for most homeowners who would love to have them. 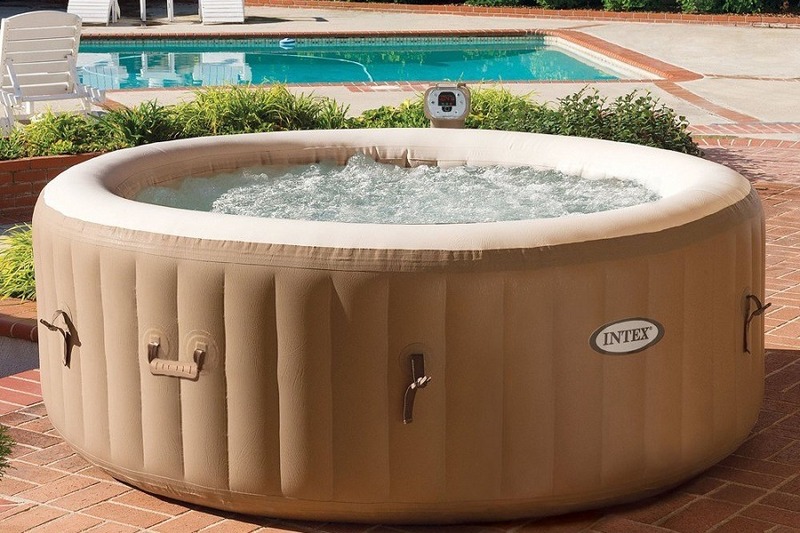 Well, those of you looking for a portable and affordable hot tub can consider Intex PureSpa. What’s better is that you can take the tub along as you move. Let's take a look at some of the most notable features of Intex PureSpa set. The Intex PureSpa has a tan exterior and the interior is light cream in color. 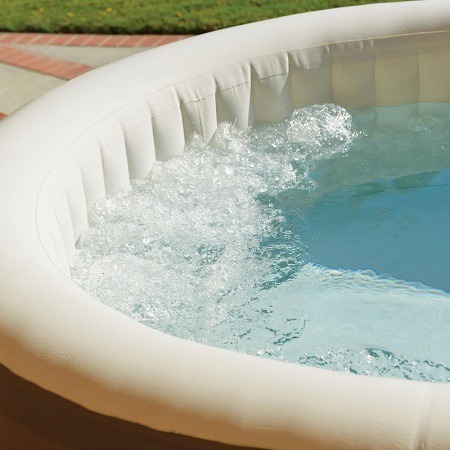 This hot tub is built with high quality, durable and puncture resistant material that is guaranteed to last for a long time. If you have a closer look at tub construction, you would find a 30 ply laminated material providing support and a high degree of comfort. Setting up Intex PureSpa is easy and requires very few tools and time. 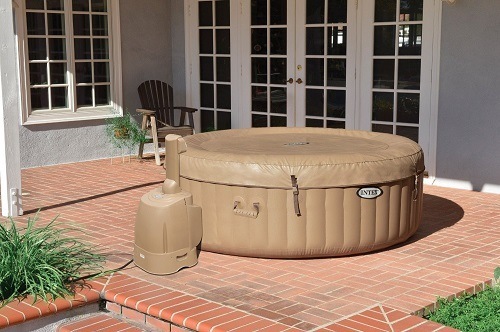 All you have to do is take the hot tub out of the box and inflate it using the hose that is provided. The inflation hose provided takes about 3 hours to fully inflate the hot tub. There are easy instructions that guide you with every step so make sure you keep the user manual handy while setting up the hot tub. The spa set includes a heating system, 2 filter cartridges, chlorine dispenser and 3-way test strip. You can use the control panel to adjust water temperature. The panel also lets you know that it’s time to change water filters. The filter cartridges as you can guess keep the water clean and refreshing. They are easy to replace and the new ones are quite affordable. Perhaps the feature that makes Intex PureSpa stand out from other spa products is the presence of an in-built water treatment system. The filter cartridges create clean, refreshing spa water and the treatment system takes care of hard water. The mild bubbles created make Intex PureSpa a positive spa experience. You can heat the water to 104 degrees using the heat pump that is included. The bottom of the tub is a smooth surface and you lounge comfortably to enjoy the spa experience. 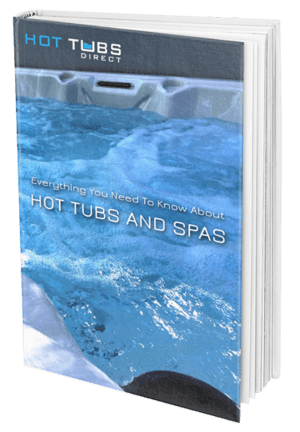 Even though Intex PureSpa is a portable hot tub, it is good enough for adults. The extra durable tub can fit up to 4 people. If you want to pamper yourself in relaxing water (104 degrees Fahrenheit), the minimum outdoor temperature must be 50 degrees Fahrenheit. Similarly, the tub should be placed on a smooth, fixed surface and make sure you don’t put it in straight sunlight for long. The water temperature rises around 2 degrees per hour so you need at least 24 hours to reach the maximum desired temperature i.e. 104 degrees Fahrenheit. Generally, Intex PureSpa tub gets a positive response from customers. Most users say that it is well made and offers good value. One of the biggest reasons customer prefer buying this hot tub is that it is easy to use and can last for years even with regular use. Unlike other portable tubs, Intex PureSpa is not shaky or wobbly. The unit is so durable and rigid that even if four people sit on the outer walls of the tub, the construction material won’t shake or explode. The model can easily be used outdoors and depending on the space you have, you can even use it indoors. Intex PureSpa has the strength and durability you require in a hot tub and at the same time, you get the comfort you desire. Perhaps the biggest thing people really appreciate about this hot tub is the low maintenance factor. The filter cartridges as well as the floating chlorine dispenser are easily replaceable. The Intex spa system includes a built-in water treatment function. This means your spa experience would feel more luxurious especially when it comes to your hair and skin. If you have hard water in your area, you can relate to this. Another useful feature of this hot tub is that there is an insulated top cover and a thermal floor mat to minimize heat loss. If you talk about the cons, some customers are not pleased with the seat-less tub. Remember that sitting in this portable heat tub is quite similar to sitting in your regular bathtub. If you’re not comfortable with this, Intex PureSpa might not be right for you. Intex PureSpa doesn’t have any issues, but some customers say that advance planning is needed if you want to use the hot tub. It can take up to 12 hours before the water is heated to 104 degrees Fahrenheit. In addition, emptying and deflating the unit isn’t the easiest task if you want to relocate the hot tub to a different location. This amazing spa set costs a little over $370. Here’s some more good news. The product includes free shipping when ordered via Amazon. Intex PureSpa package includes 2 filter cartridges, floating chlorine dispenser to kill the germs, carry bag, inflation hose, thermal floor mat, 3-way test strip and of course, the heating system. Made with durable, puncture resistant 3-ply laminate material, this Intex PureSpa is one of the most cost-effective hot tub you can own. The inflatable, mobile spa system is strong and can be easily set up indoors and outdoors depending on your personal preference. If you don’t want to spend a fortune on a Jacuzzi, Intex PureSpa bubble massage spa set is just the right product you need. Not only you can experience a feeling of calmness, but you can also enjoy the spa benefits within the comfort of your home.